The First Presbyterian Church of Watertown has been built on years of faith. The oldest house of worship in Watertown, NY, our church has been consistently supported by its congregation. Hart Massey, Henry Coffeen and Zachariah Butterfield were the pioneer builders of Watertown. They came here in March, 1800 from New Hampshire and Vermont, purchasing land from Nicholas Low. They felled trees and erected windowless, dirt floor cabins in what is now Public Square. One month after their arrival, the first religious service in the new community was held in Hart Massey's cabin. The origins of the First Presbyterian Church can be traced to June 3, 1803, when thirteen men and women held services conducted by the Rev. Ebenezer Lazelle for the first time in a barn owned by Caleb Burnham in the nearby hamlet of Burrville. As time passed, Watertown began to flourish and surpassed Burrville in growth because of better water power. It was proposed in 1811 that a church be constructed midway between Watertown and Burrville. The War of 1812 blocked that proposal. Hart Massey served on active duty in the militia during the war. With the Rev. Daniel Banks as pastor, the Watertown-Burrville congregation grew despite lacking a church building. In 1820, a site was obtained at the corner of Washington and Academy Streets, and a church structure of stone was erected. It was dedicated on January 1, 1821 and received into the St. Lawrence Presbytery. The building cost $9,000 to build. It was two stories tall, with a dome-like tower over the entrance. The interior was lit by two tiers of windows, above and below the galleries which occupied the two sides and rear. The woodwork and pews were painted white. Our present brick church was built in 1851 on this same site when the congregation outgrew the stone church and no suitable plan was devised to enlarge it. It was dedicated on April 10, 1851. The building was 102 feet long, 63 feet wide, and the walls were 16 inches thick. The total cost was $17,000. 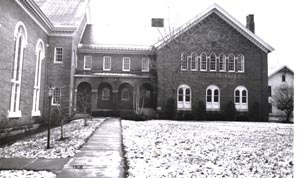 In 1852 a new chapel was built as an addition. This is now our Fellowship Hall. In 1864 and again in 1874, winter storms damaged the church. In 1864 the chapel roof was swept away during a severe wind storm. At both times, the congregation rose quickly to the challenge to repair and maintain the church. In 1875 a new steeple was erected. It is the same steeple that has graced and dominated the city's skyline for over 135 years. Further renovations to our church were made in 1892. The front portico was erected and additions were made to the narthex at each side of the main entrance to provide stairs to the balcony. At this time, a new organ was installed. The stained glass window "Christ and the Doctors" was installed in the steeple in 1893 as a gift from Mrs. Rosa in memory of her husband, Dr. W.V.V. Rosa. From 1926 to 1928 the two-story educational building was constructed. This building contained the pastor's study, chapel, women's parlor and Sunday School classrooms. It was this year that the former chapel was converted into Fellowship Hall and a stage added. In 1951 the resplendent Celtic Cross of multi-colored Venetian mosaic was placed in the chancel. The present organ was installed by the Austin Organ Company in 1960. It is a superb instrument which contains 48 ranks, 3 manuals, 4 divisions and over 3000 pipes. In 1986 a building inspection revealed that the roof support system over Fellowship Hall was deteriorating and had to be stabilized. At the same time, multiple defects were found in the foundation, exterior walls and many other areas. A major stabilization and repair project was recommended. A fund drive raised over $850,000. The repairs were and are being accomplished and the church is once again a strong and stable structure. Repairs to the outside bricks were undertaken in 1999, and the organ was refurbished in 2000. In 2011 the organ console was replaced and digital ranks were added. The chancel was renovated in 2012 to make the space more flexible. Our church has furnished several of its sons and daughters to government service, including Robert Lansing, Secretary of State to Woodrow Wilson; John Foster Dulles, Secretary of State in the Eisenhower administration; Allen Dulles, an early director of the CIA; and Charles Yost, Ambassador to the United Nations. The Dulles brothers were sons of Allen Macy Dulles, who was pastor of this church from 1897 to 1904. The year 2003 saw the celebration of our bicentennial with many special activities. Several of our former pastors were able to visit and deliver special services. A rare treat was the visit by Avery Cardinal Dulles. First Presbyterian Church is more than bricks and mortar, paint and plaster, stained glass and mosaic. It is a church that is people and family, love and devotion, and faithfulness and spirituality. From Hart Massey and Caleb Burnham, in whose barn the first congregation met, to the Lansing and Dulles families and all those Sunday school teachers, choir members, church officers, ministers, and women and men of our congregation who gave so much of themselves, we have received a precious legacy. The heritage of Christian witness here enables us to carry on the work of Jesus Christ, and to know that, as we approach our third century, new leaders with vision and foresight will emerge to preserve, protect and nurture the faith that has been bequeathed to them. Our church is a symbol of beauty and continuity. Each generation has worked diligently to preserve its graceful structure. The First Presbyterian Church has been built and will continue to grow in years of faith.